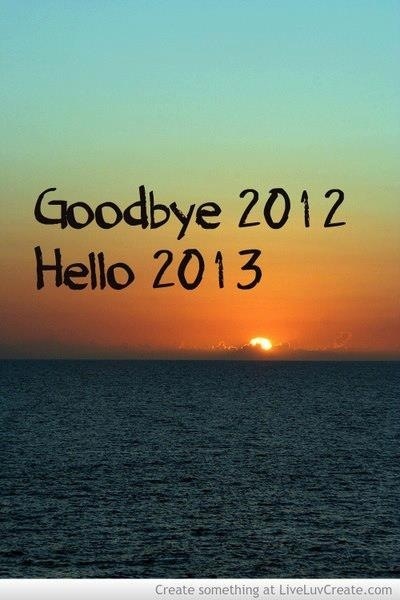 Part of welcoming the New Year, is saying goodbye to the previous one. Looking back on the blessings and the hard times that year held. Looking at the ways God changed our hearts and our minds, and looking eagerly to the future of what God will teach us in the New Year. John Mark (the Pastor of the church I attend- Solid Rock) said something on Sunday that really convicted me. He said that (and I'm paraphrasing) it is difficult to know the heart of God when we have only read excerpts from his book. "His" being God... not John Mark. Basically saying that in order to know who God is we need to read the Bible cover to cover. It was already a goal of mine for this year to read the Bible all the way through. Here is a chart you can follow from Solid Rocks's website to read through the Bible in one year. Another goal of mine is to be more outwardly thankful for not only the blessings in my life but for the hard times too. Looking back on 2012 and the hard times (school, relational aspects with Michael and friends, Job hardships) it all led to good lessons learned and makes me a more thankful person in the year 2013. The Lord takes us to the mountain tops to experience his goodness and his faithfulness, but you know what? It is in the valleys where the fruit is grown, not on the mountain tops where it is impossible for fruit to develop. The valleys are never very fun, but so much growth is done that it is necessary. We need to be thankful for those times too. I read in my devotional book this morning "Jesus Calling" and it spoke on this exact topic saying, "When adversity strikes and you thank me anyway, your trust in My sovereignty is a show-piece in invisible realms." I pray that in the New Year my friends we together take an outlook of thankfulness for the good and the bad times. Let us be people who Praise our Father during the storms (as cliche' as that may be).